Hawthorn & Estuary are now open as Osprey Lake & Sawgrass Bay are now SOLD OUT. The 81 homesites surround two pristine lakes and provide tranquil water views. Plans include a selection of four home plans ranging in size from approximately 3000 sq. ft. to over 4,000 sq. ft. Some unique home features include one and two floor home styles, three car garage, expansive master bedroom and elegantly appointed bath, gourmet island kitchen with breakfast nook and vaulted/coffered ceilings. PRE-CONSTRUCTION & NEW CONSTRUCTION AVAILABLE IN HERONBAY. EVERYONE IS EXCITED ABOUT THE NEW CONSTRUCTION IN PARKLAND FLORIDA AT HERONBAY! Lot Premiums will range from $10,000 to $60,000 depending on size and location. There are some great lake views and private views with berms. Get brand new homes in Heron Bay and pick you own features and upgrades. Impact glass throughout. Pools available. Models and pricing are below. Banyan at 3671 square feet with 5 beds, club room, 3 baths & 2 car garage. Two story home with master bedroom downstairs priced about $560k. Poinciana at 4000 square feet with 5 beds, 4.5 baths & 3 car garage. Two story home with master bedroom upstairs priced about $640k. Hawthorn at 4106 square feet with 6 beds, 4.5 baths & 3 car garage. Two story home with master bedroom downstairs priced about $650k. Once you add lot premiums and upgrades these prices can go up $50,000 or more. Somerset - Somerset features 3, 4 & 5 bedroom model plans, with different elevations & some designed in a Southern Coastal architectural style. Plans include three blocks for a total of 115 homesites surrounding three pristine lakes. Floor plans range from a one-story home at approximately 1900 square feet that will start about $350,000 to the largest two-story at approximately 3200 square feet that will include 5 bedrooms and a 3 car garage for about $500,000. Each home includes hurricane impact glass, granite countertops, wood cabinets and may great features are included. Of course each buyer can customize their home to their taste by upgrading cabinets, flooring & more. The Southern Coastal design is new to the community and stems from the classic coastal look reminiscent of a New England meets Key West look and feel. EVERYONE IS EXCITED ABOUT THE NEW CONSTRUCTION IN PARKLAND FLORIDA AT HERONBAY! Lot Premiums will range from $10,000 to $60,000 depending on size and location. There are some great lake views and private views with berms. 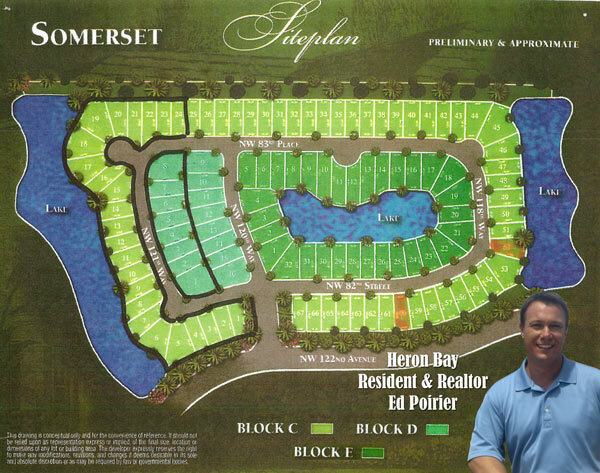 Get brand new homes in Heron Bay starting May 1, 2011. Allamanda at 2550 square feet with 5 beds, 3 baths & 2 car garage. Two story home with master bedroom downstairs priced about $400k. Magnolia at 2710 square feet with 4 beds, 3 baths & 2 car garage. Two story home with master bedroom upstairs priced about $410k. Jasmine at 3126 square feet with 5 beds plus den, 4 baths & 3 car garage. Two story home with master bedroom upstairs priced about $480k. Brought to you by Heron Bay Resident & Parkland FL Real Estate Agent Ed Poirier. HERON BAY IS A Florida's BEST Silver Award Winner! With refined Country Club grace, you can play where the Pro's have at the famous TPC at Heron Bay . Gardens of tropical foilage highlight the communities integrated trail system leading to The Commons, Heron Bay 's outstanding recreational facility. Recharge with an intense cardio workout, hit the weights or enjoy some outdoor raquetball. After a friendly tennis match on one of Heron Bay's Har-Tru courts, relax with a refreshing swim in our waterfall pool or indulge with a dip in the Jacuzzi. Whatever the recreational or social pleasure you seek, Heron Bay provides an array of amenities to invigorate both body and soul. Heron Bay's ideal location also offers convenient access to all necessary services and modern healthcare facilities. BBB Ranches - Lot sizes are typically over 2+ acres. Country Point - Smaller homes on 1/3 to 1/2 acre lots. Cypress Cay - This gated community is on both sides of Parkside Drive, near Riverglades Elementary School. Lovely homes on smaller lots (1/4 acre). Cypress Head - Large homes and estates on 3/4+ acre lots. Cypress Trails - Mid-size homes on 1/2+ acre lots. Fox Ridge - Mid-size and large homes on 1/3+ acre lots. Fox Ridge Estates - Mid-size, large and estate homes on 1/2+ acre lots. Grand Cypress - Mid-size homes in the $900,000 price range on 1/2+ acre lots. Heron Bay - Home and lot sizes vary. In The Pines - Large homes in a gated estate on large lots. Parkland Isles - Newer homes on smaller lots. Mayfair - Smaller homes on 1/4 acre lots. Meadow Run - Mid-size homes on 1/3+ acre lots. Lakes At Parkland - Smaller homes in the $450,000 price range on 1/4 acre lots. Parkside - Smaller homes in the $250,000 price range on 1/4 acre lots. Parkland Isles - 608 homes ranging from $375,000 to $700,000 plus. Parkland Place - Smaller homes in the $450,000 price range on 1/4 acre lots. Parkwood - Smaller homes in the $450,000 price range on 1/4 acre lots. Pinetree Estates - Acre lots that feature homes ranging from $500,000 to over $2 million. Riverside Acres - Larger homes on acre+ lots. Sable Pass - Mid-size homes on 1/4 acre lots. Tall Pines - An upscale gated community with a magnificent estate section. Ternbridge - Mid-size and large homes on 1/3+ acre lots. Ternbridge Estates - Mid-size and large homes on 1/3+ acre lots. The Landings - Mid-size homes on 1/3+ acre lots. The Landings Estates - Mid-size homes on 1/2+ acre lots. The Mews - Countryside setting, smaller tasteful homes. Terramar - Smaller homes on 1/4 acre lots. Water's Edge - Mid-size homes on small waterfront lots. Whittier Oaks - Mid-size homes on 1/3+ acre lots. Welcome home ... to Heron Bay Parkland, Florida. Heron Bay, in Parkland, Florida, offers grand and gracious country club living at its finest with a perfect balance between man and nature. 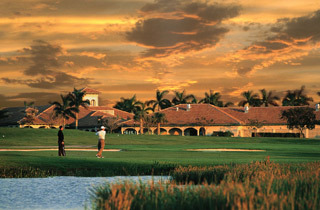 Spanning the cities of Coral Springs and Parkland, the community's environmentally conscientious design and inspired neighborhoods have earned numerous awards including the distinction of being one of the first golfing communities in Florida to be a registered member of Audubon International Cooperative Sanctuary Program. The championship 18 hole TPC golf course, designed by Mark McCumber, has hosted such noteworthy events as The Honda Classic. Residents range in age from young families in their first starter homes to well-established professionals and executives who own estate homes overlooking the golf course or some of the beautiful lakes that grace the community. Most of the residents live at Heron Bay year-round, but a significant number choose this lovely location for a seasonal residence. Heron Bay offers convenient access to all necessary services. Modern healthcare facilities are nearby, and the community is nearly midway between the Ft. Lauderdale and West Palm Beach international airports. Shopping is great, whether you are looking for the most exclusive shops on Worth Avenue in nearby Palm Beach or for regional mall shopping -- The Gardens Mall in Palm Beach Gardens, Coral Square Mall in Parkland, the Boca Town Center in nearby Boca Raton. Educational opportunities are excellent ranging from award-winning grade and high schools in the Broward County School District to some of the nation's finest parochial schools, a vocational-technical school and several institutions of advanced learning. There are over 20 institutions of higher learning within commuting distance of Heron Bay. Technical, undergraduate and advanced degrees are available at the local campuses of Broward Community College North and Atlantic Voc/Tech in Coconut Creek, Lynn University and Florida Atlantic University and Palm Beach Community College South in Boca Raton and Nova Southeastern University in Davie. Houses of worship in the area provide for all religious preferences, and it is just an easy drive to enjoy sporting events, entertainment and the arts as well as excellent restaurants and all community services. The nearby Atlantic Ocean beaches are a major attraction, while parks and recreational facilities abound. The Heron Bay community offers many facilities and amenities, such as The Commons, clubhouse and recreational center. Buying home owners insurance for your new home? Clearsurance is a useful site to do your research before you purchase insurance. Many of the Homes at Heron Bay have spectacular views of the Championship 18-Hole TPC Golf Course interlaced throughout the Community. The course is the Former Home of The Honda Classic and is run on a Daily Fee Structure. Also is an 18,500 square foot Clubhouse with Pro Shop and Restaurant overlooking the course. Enjoy this Championship Facility with the Expense of Equity Membership. Billiards Room, Fitness Room, Party Room overlooking the Everglades with Catering Kitchen as well as a Resort-Style Pool with Spa, Tiki Bar and Picturesque Waterfall. Many communities activities are held here such as the various Club Meetings and Children's activities. Under Construction is this Fabulous Sports and Social Club located at Heron Bay North which should be completed by the end of 2003. There you will find such amenities as a Resort-Style Pool with Spa, Fitness Center with State-of-the-Art Equipment, Aerobics Studio, Banquet Hall, Sauna and Treatment Rooms, Classrooms, Racquetball and Basketball Courts. Heron Bay has 3 in-house Tennis Teaching Professionals who conduct an extensive program for the beginner as well as the advanced player. Heron Bay teams participate in Men's and Women's Leagues as well as in-house Round Robins and Lessons any day of the week. 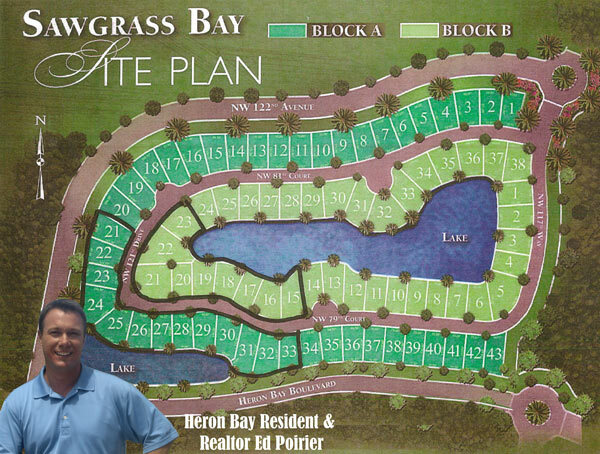 HERON BAY - WHAT'S NEW? Parkland, Parkland Golf & Country Club, Parkland Ranches, Majestic Grove, BBB Ranches, Club Estates at Parkland, Pinetree Estates, Cypress Head, Parkland Lakes, Tall Pines, Parkland Magic, Gables Estates, Alhambra, Parkland Golf & CC, Bella Flor, Alhambra Collection, Country Acres, Bennington, Fox Ridge, Pinehurst Woods, The Landings, The Landings Estates, Oaktree Estates, Meadow Run, Ternbridge, Parkland Isles, Country Point, Waters Edge at Parkland, Whittier Oaks, Parkland Place, Bay Cove, The Lakes at Parkland, Cypress Cay, The Mews of Cypresshead, Parkside Estates, Mayfair at Parkland, Mill Run. A connoisseur's luxury retreat, set in the heart of Heron Bay. This exclusive neighborhood of Heron Estates is totally surrounded by dazzling water and championship golf course. Each of these 81 exclusive homesites will be graced with homes of architectural grandeur that offer palatial luxury and captures some of the finest views in Heron Bay. The Glen - this intimate neighborhood offers just 58 homesites with spectacular water and tropical views. Residents enjoy a lifestyle with relaxed island flavor and a convenient location just beyond the north entrance with access to the upcoming new north clubhouse. Surrounded by water and overlooking a bird sanctuary, Creekside offers 143 distinguished single-family homes. Beyond spectacular views, this picturesque neighborhood features a marvelous variety of 15 elevation choices defined by symmetry and style with substantial interior volume. A truly unique and breathtaking enclave in the north section of Heron Bay having three peninsulas joined by bridges and preserve. The Greenbriar has two interior lakes and offers just 51 estate homes set on lots with dazzling waterviews. Residents and guests enjoy the 18-hole championship Tournament Players Club (TPC) golf course designed by PGA TOUR professional and golf course architect Mark McCumber. This immaculate course has hosted such noteworthy events as the PGA TOUR's Honda Classic. With a daily fee structure, this TPC course and its magnificent 18,500-sq.-ft. clubhouse offer you a championship facility without the expense of equity membership. HeronBay is called Heronbays and is located in CoralSprings and Park Land FLA.
Heron Bay's ideal location offers convenient access to all necessary services and modern healthcare facilities. The community is nearly midway between the Fort Lauderdale and West Palm Beach International Airports. Shopping is great! Enjoy the exclusive shops on Worth Avenue Palm Beach, the world-renowned class of Bal Harbour and the incredible variety of other fine regional malls and local shopping centers in between. The tennis facility consists of six Hydro-Grid clay courts, two hard courts, all of which are open daily until 10 p.m. A full-time tennis professional is on site to teach residents one-on-one and offer group clinics. There are weekly round robin tournaments for players of all levels.  Bikepaths sidewalks and trails..8.5 miles. Haron Bay is a great community and Heran Bay is a Prudential WCI built property with new construction and more. Parklands favorite place including the Parkland Golf and Country Club is just part of the story! 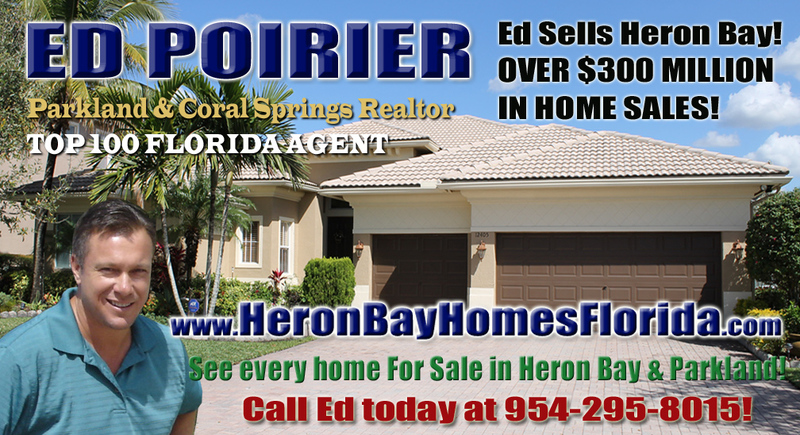 Call Ed Poirier at 954-295-8015 for Heron Bay information! Residents range in age from young families to well-established professionals and executives who own estate homes overlooking the golf course or some of the beautiful lakes that grace the community. Most of the residents live at Heron Bay year-round, but a significant number choose this lovely location for a seasonal residence. Houses of worship in the area provide for all religious preferences, and it is just an easy drive to enjoy sporting events, entertainment and the arts as well as excellent restaurants and all community services. The nearby Atlantic Ocean beaches are great while parks and recreational facilities abound. And all Heron Bay residents enjoy the facilities and amenities available to them at their own recreational center at The Commons.